Here in Denver today is PJ Day. Today is actually the 8th Annual Denver PJ Day. PJ Day is a visual reminder that not everyone has a place to sleep at night - or a place to put their PJ's. Companies participating in PJ Day make a donation to Denver's Road Home. Today our executive committee donned their "formal" PJ's and made pancakes for all of us in the employee cafeteria. Footie pajamas are back!!! In honor of PJ day, I wore my slippers and my Peruvian Party Pants at work. I'm sure that I was just as competent, and much more comfortable, than my normal business attire. What? You don't have a pair of PPP's? They tend to be brightly colored drawstring pants with a pocket on the side. Of course, you buy them in a market, so you don't exactly get to try them on. One of my PPP's never quite fit right. But my pink party pants were rockin' today in the back halls. 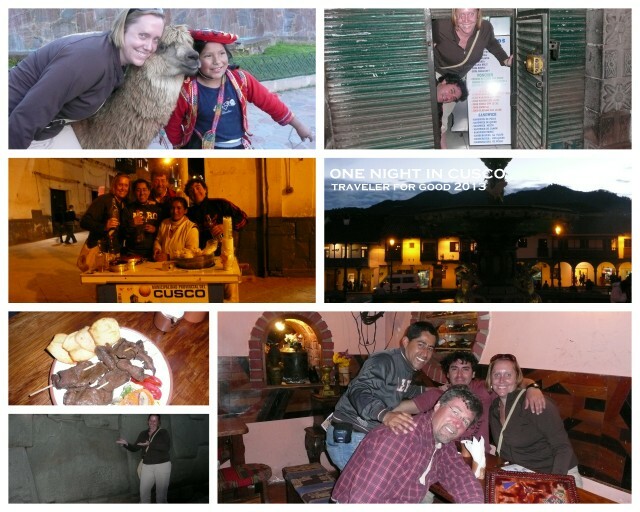 Incidentally, on this day in 2010 I was in Peru, the land of party pants, ceviche, sangria in a box and more Inca ruins than you can shake a llama at. I've heard that Machu Picchu is also in Peru. I've only seen pictures. Other people's pictures. There were mudslides in Peru a few weeks before we went, so MP was closed. The actual process of getting to Cusco involved partying the night before, eating breakfast on a beach side terrace, an on and off road adventure driving from the beach back to Lima while praying we didn't miss our flight. Our in-country flight that cost almost as much as our international flight from Denver to Lima. Actually landing in Cusco was such a relief that we wanted to get out and explore. And then there's emoliente. It's a drink that's "good for you" made by street vendors. Wikipedia doesn't even have a definition in English. Only in Spanish. Emoliente es una bebida utilizada con fines medicinales en Perú, Bolivia, Ecuador, Colombia y, en menor medida, el resto de Latinoamérica. El emoliente es una bebida peruana tradicional que se prepara en base a granos tostados de cebada, extractos de hierbas medicinales, azúcar y jugo de limón. Es de bajo contenido nutricional, aunque puede aportar a la dieta algo de carbohidratos, minerales y vitamina C. Su mejor valor es el medicinal. It's a medicinal drink in Peru and other countries made from barley, herbs, sugar and lemon juice. I didn't ask questions. I just drank it.